Executive Order 9066 was a presidential executive order. It was signed and issued during World War II by the President of the United States Franklin D. Roosevelt on February 19, 1942, authorizing the Secretary of War to prescribe certain areas as military zones. The order cleared the way for the deportation of Japanese Americans to internment camps. As a result, tens of thousands of Japanese Americans and Japanese nationals were interned during the war. The same order was also applied to numbers of American residents of Italian or German descent. After the Japanese attack on Pearl Harbor, the United States was very suddenly at war. Fear, outrage and hatred of the Japanese over the surprise attack was aimed at the Japanese Americans living in the U.S. It became a common belief that the amount of destruction, including most of the U.S. Naval fleet, was because Japanese Americans helped plan the attack. There was also the immediate fear that with the Pacific fleet severely damaged, the Japanese would invade the West Coast of the United States. President Franklin Roosevelt issued the order on February 19, 1942. It ordered the evacuation of all persons who could be considered a threat to national security from the West Coast to relocation centers further inland. Over 100,000 Japanese American men, women and children were moved to assembly areas. From there they were moved to camps which were isolated and guarded. ↑ 1.0 1.1 "Executive Order 9066: The President Authorizes Japanese Relocation". History Matters. Retrieved 1 April 2016. ↑ 2.0 2.1 2.2 "About Executive Order 9066". Japanese American National Museum. Retrieved 1 April 2016. 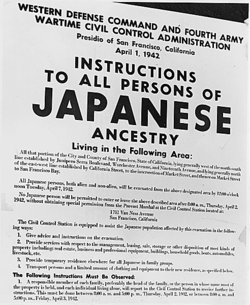 ↑ 3.0 3.1 3.2 "Document for February 19th: Executive Order 9066: Resulting in the Relocation of Japanese". The National Archives. Retrieved 1 April 2016. ↑ "Transcript of Executive Order 9066: Resulting in the Relocation of Japanese (1942)". Our Documents. Retrieved 1 April 2016. This page was last changed on 15 August 2018, at 06:47.